Disclosure: This is a partnered post with Hunter PR for Honey Bunches of Oats. All opinions are my own. Breakfast is one of the most important meals of the day, but with today’s busy lifestyles, we don’t always have time to make a feast in the morning. Cereal is a staple of our house; it’s great for almost any morning and even those late nights when I need a little extra before going to bed. My husband and I don’t always agree on the same items, but Honey Bunches of Oats is a perfect agreement and you can always find it in our cupboards. So, I was very excited that Post Foods introduced two new varieties of our favorite cereal. 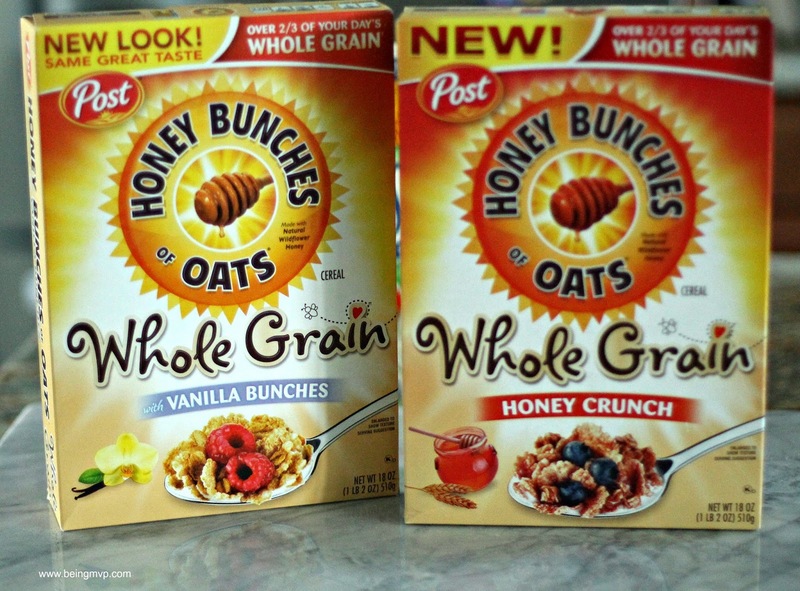 The new Honey Bunches of Oats Whole Grain Honey Crunch and Honey Bunches of Oats Whole Grain Vanilla Bunches is a great addition. Now, we are able to have our favorite cereal packed with even more nutrition and the same great taste. The cereals have crispy flakes with granola clusters which is a great taste and texture compared to most cereals that become soggy almost instantaneously. The Honey Crunch has a touch of honey while the Vanilla Bunches has a touch of real vanilla; both providing a subtle sweetness that perfectly compliments the granola clusters. The Honey Bunches of Oats Whole Grain cereals are filled with nutrients for our entire family including whole grain servings, fiber and protein. Unlike other cereals, these leave you fully satisfied. Even on my hungriest days, a bowl of Honey Bunches of Oats seems to satiate me and lasts me for hours. Knowing that my satisfaction comes from a bowl of healthy goodness keeps me happy. Connect with Honey Bunches of Oats on Facebook. How do you stay satisfied for a busy day? What do you think about the Honey Bunches of Oats Whole Grain cereals? I haven't had Honey Bunches of Oats in years. I should pick up a box. I love these! 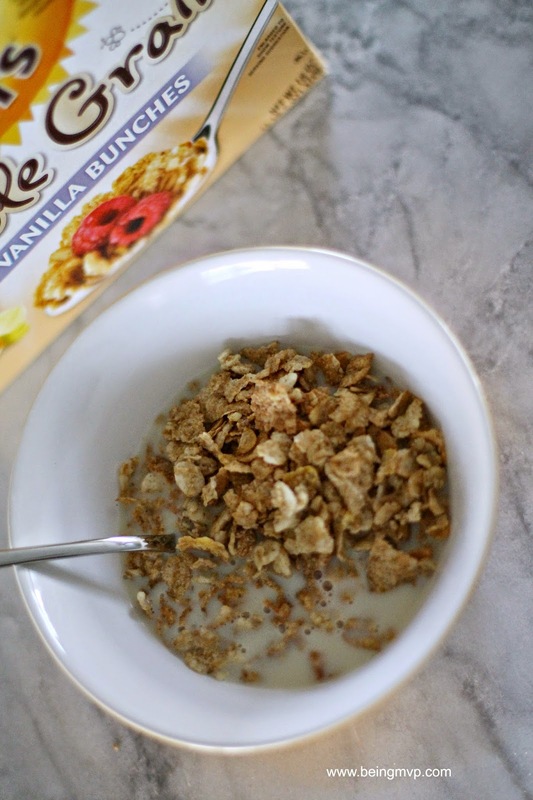 I'm a huge Honey Bunches of Oats fan, and now they're even healthier! Yay! Honey Bunches of Oats is the bizomb! I love that they have a whole grain version. Yum! I had no idea that Honey Bunches of Oats had a whole grain version. I am going to have to look for this. I eat Honey Bunches several times a week but usually as dessert with some granola and fresh fruit in a parfait. I am just always too rushed for actual breakfast, but I should give it a try. I adore honey bunches of oats, and it's so fulling! I find a lot of cereals don't fill you up, but this one is delish and does! This happens to be one of my favorite cereals ever! I love it with some cold milk in the morning! I definitely make sure I have plenty of fiber - if I eat snacks that aren't filling long-term then I find myself munching more overall throughout the day. This cereal looks delicious... I'll have to add it to my breakfast - and snack - rotation! These look so good (awesome photos!!). I'll have to put it on our grocery list to try! I haven't had Honey Bunches of Oats in ages, but It's one of my favorites!! Thanks for reminding me to get some on our next shopping trip!! We'll have to try these at my house too! My family loves Honey Bunches of oats! Now we are excited to try the whole grain options! We eat Honey Bunches of Oats all of the time! That's awesome that there's a whole grain kind now! We will be trying it! The vanilla cereal sounds delicious! I like the normal flavor but I'll have to give vanilla a shot! I love these cereals and so do my kids. They make a great snack too! My three year old would crush an entire box of these before lunch if I let him. I like them, but he would probably eat nothing else if I let him. Nice to know they're good for him (in moderation, of course). I've always LOVED Honey Bunches of Oats! It happens to be my favorite cereal. We are fighting an ongoing battle to eat better around here. Luckily, Honey bunches fits that bill and tastes great too. We love honey bunches of oats cereal. These 2 new varieties look really good.